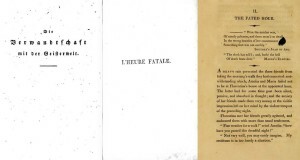 The fifth story in both Gespensterbuch and Fantasmagoriana (vol 2), ‘L’Heure fatale’ / ‘The Fated Hour,’ is the second story in Tales of the Dead. 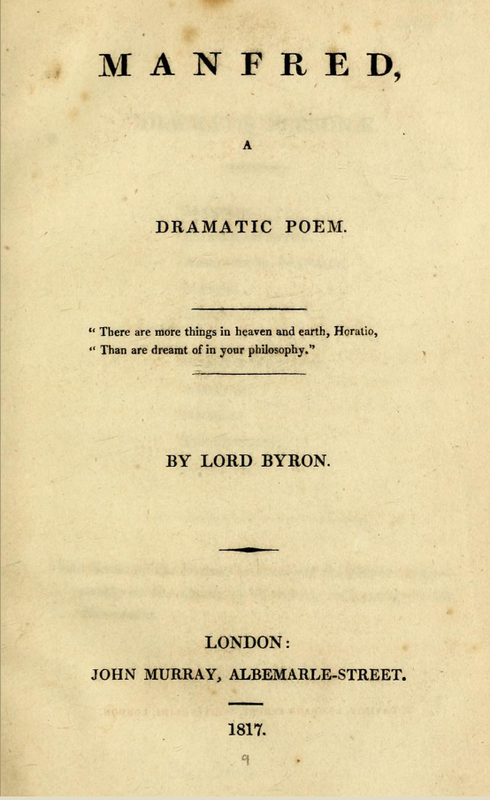 It appears to have been more of an influence on Byron’s Manfred (1817) than Mary Shelley’s Frankenstein. First, the provenance path from the German source to the French and English translations. 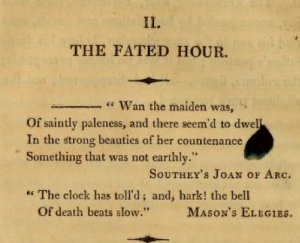 Yet another story written by Schulze, the title of the story literally translates in English to: ‘The Relationship with the Spirit World.’ The thematically translated French title chooses to foreground the supernatural mystery of the fated hour of death. The German original is 39 pages; the French translation 55 pages, and; the English edition numbers 29 pages. The character of Count Bruno is renamed Ernest in the French and English translations. There are other particulars that are lost in the English translation, but overall the plot of the story is consistent. 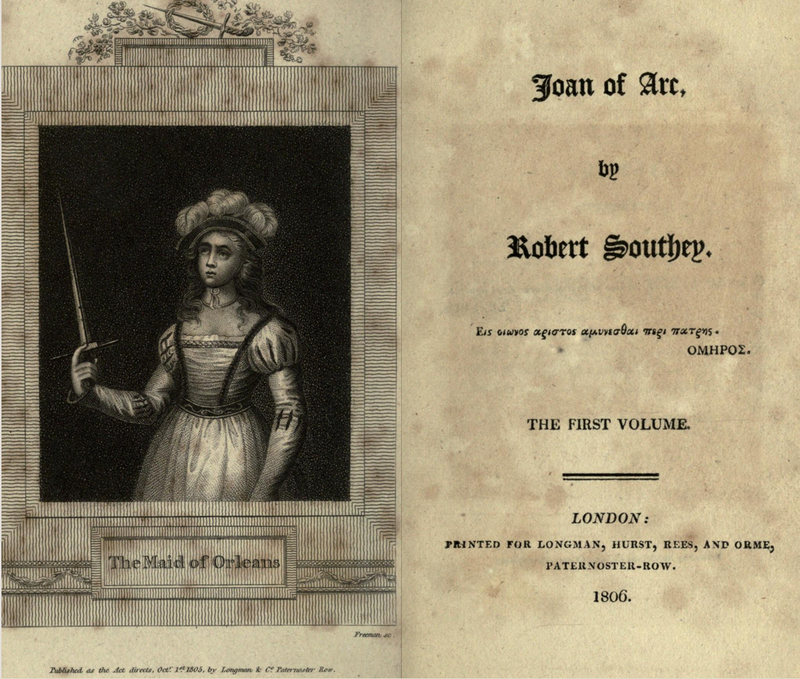 The first epigraph from Southey’s Joan of Arc (1796; 1806) refers to the ‘L’Heure fatale’ character of Seraphine, who when communicating with the spirit world, is also pale and who becomes a phantom. Of death beats slow.’ Mason’s Elegies. These are the opening lines to William Mason’s (1724-1797) ‘Elegy III: On the Death of a Lady’ (1763). 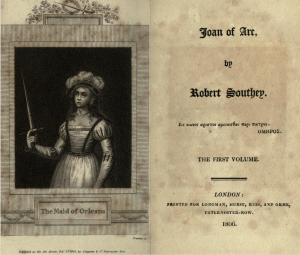 These two popular works frame the plot, as well as the character of Seraphine, for the English audience. Amelia and Maria visit Florentina. Count Ernest is set to return the following day and hopes to have Florentina marry him. Despite these prospects, the hostess receives her guests in a state of agitation. Amelia and Maria suspect something extraordinary has occurred. Maria confesses that while staying overnight at Florentina’s she has felt someone opening and closing windows and has heard footsteps. Amelia agrees she has heard these noises frequently as well, but has never seen anyone. Florentina responds by promising that ‘this evening—-if I am still alive—-I mean to say—-that this evening I shall be better able to communicate all to you’ (Tales of the Dead, 67). Amelia and Maria withdraw from Florentina’s company. The three meet again in the evening and Florentina appears recovered, apologizing for her ‘abstraction of this morning’ (Tales of the Dead, 68). She has made her will and finds herself in good spirits, feeling that she has escaped ‘the danger that threatened’ her. Florentina then proceeds to tell the story of her fright. Florentina had a younger sister named Seraphina, who had died shortly before. Seraphina had a habit of staring as if absorbed in her thoughts. Her father, the next prince in line, was concerned about his daughter’s behaviour. Given their family rank he had his daughter examined. This revealed that she was of a superior intellect. Seraphina then studies and becomes interested in science of astronomy which she continues even after the sudden passing of their mother. Growing into a lovely young woman, Seraphina receives offers of marriage, but declines all of them preferring her own company. Returning from a visit, Florentina finds Seraphina sitting, with her eyes fixed, in her father’s cabinet by the window. She goes over and hugs her, and simultaneously looks out of the window to see Seraphina walking with her father in the garden. The Seraphina by the window feels cold and begins to recover. Florentina now sees her father walking alone. Seraphina is ignorant of being in two places at the same time, even upon the entrance of her father who asks how she could have disappeared from his side in the garden and made her way to the room before him. Seraphina is at a loss how this happened, yet, stories had reached Florentina before that she was seen elsewhere when her family had clearly seen her in the house. Seraphina experiences another trance resulting in her becoming ‘mute and inanimate.’ Upon recovering, she has a long conversation with her father, emerging in tears. She will tell her sister part of the mystery, but on the ‘irrevocable condition’ that Florentina ‘will rest satisfied with what I shall disclose to you, and that you will never urge nor use that power which you possess over my heart, to obtain a knowledge of what I am obliged to conceal to you’ (Tales of the Dead, 78-79). Seraphine starts her story noting that she earnestly prayed in vain for their mother to appear to her after death. One day she thinks she hears footsteps behind her, but sees nothing supernatural. Then, while standing before her wardrobe, the two doors opened on their own, the lamp she was holding went out, and out of the looking-glass stepped her exact image with a light that illuminated the room. 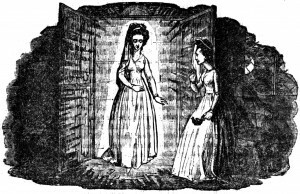 Her doppelganger then addresses her: ‘Why tremble you at the sight of your own spirit, which appears to give you warning of your approaching dissolution, and to reveal to you the fate of your house?’ (Tales of the Dead, 81). The phantom then tells Seraphine of future events, but when asking about Florentina’s fate, the room became dark and her spirit disappeared. Her father would make her acquainted with further details should the future dictate this necessity. Florentina is distraught at the thought of her sister’s pending death. Three days afterwards, Seraphine falls ill. She asks ‘Will the clock soon strike nine?’ The clock strikes the hour, and she dies. A while after Seraphine’s death, her father falls into disgrace, and informs Florentina that ‘Seraphina’s second prophecy is also accomplished’ (Tales of the Dead, 87). They withdraw from the estate and his father falls ill. His death appears unavoidable, and he tells his daughter that Seraphina ‘has twice predicted true; and will a third time’ (Tales of the Dead, 88). He informs his daughter that when the ‘clock strikes nine according to Seraphina’s prediction I shall be no more’ (Tales of the Dead, 89). 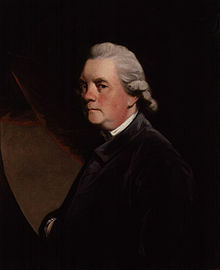 He cautions her not to marry, but should she choose, then she is beseeched to read ‘this paper’ which he gives her with the expressed condition ‘not [to] open it beforehand, as in that case its contents would cause you unnecessary misery’ (Tales of the Dead, 89). The clock strikes the fated hour of nine and Florentina’s father dies. Her marriage to Count Ernest becoming a certainty, Florentina opens the paper and reads it to Amelia and Maria. The letter communicates that rather than disappearing when asked about Florentina, the phantom had revealed to Seraphina that should Florentina marry, then ‘three days before that fixed on [date] for your marriage, you would die at the same ninth hour which has been so fatal to us’ (Tales of the Dead, 90). Her father feared that by marrying she will die, and although it might not save her from her fate, he hopes she will stay single. He withheld this information from her to avoid her any ‘premature uneasiness’ (Tales of the Dead, 91). Florentina folds the paper and concludes her narrative. Count Ernest will return tomorrow and three days hence has been fixed for their wedding. Amelia and Maria conclude that this very day is the decisive day of the curse. Florentina confesses that it has been especially frightful in the morning, but now feels composed, healthy, and confident that she is safe because nothing has happened during the day. In addition, she has a feeling that her sister will appear to her and ‘defeat the prediction concerning me’ (Tales of the Dead, 92). Maria and Amelia gaze at the clock in terror as it strikes the fated hour of nine. Florentina walks towards the door and embraces the figure of Seraphina. The phantom disappears and Florentina is found dead at the door. There are a few plot-devices and motifs that may have had a slight influence on Frankenstein. The phantom-double of Seraphine, created by her own reflection in the mirror, is figuratively active in Frankenstein’s creation of the Monster/Creature who has been interpreted as Victor’s ‘double.’ This is a general plot-device and certainly Shelley’s use of the ‘double’ device embodies a masterful complexity throughout her novel that is absent from the story. (Frankenstein, Volume II, Chapter viii. Macdonald and Scherf, 167). In ‘L’Heure fatale,’ the father confesses to Florentina that ‘If possible, remain in your present state; never marry. Destiny appears to have conspired against our race’ (Tales of the Dead, 89). Whether due to Florentina’s unmarried and thus childless state, or her supernatural death before her marriage, as the last of her family line, their house will be extinguished. This motif of an unexplained and supernatural haunting of Florentina’s family gains a rationale in the Monster/Creature’s specifically targeting Frankenstein’s friends and family to force him to create a female companion. The effect, however, is similar that the house of Frankenstein is ultimately destroyed with Victor’s death. While the motif operates in both narratives, it is again Shelley’s genius that imbues and develops it with psychological and thematic depth. Seraphine’s question about Florentina’s fate remains unanswered. I live but in the sound—it is thy voice! Phan. Manfred! To-morrow ends thine earthly ills. Man. Yet one word more—am I forgiven? Man. Say, shall we meet again? Man. One word for mercy! Say thou lovest me. The “Astarte scene” is a crucial and dramatic scene in characterizing Manfred’s psychological turmoil, specifically, the mystery of Astarte’s death. 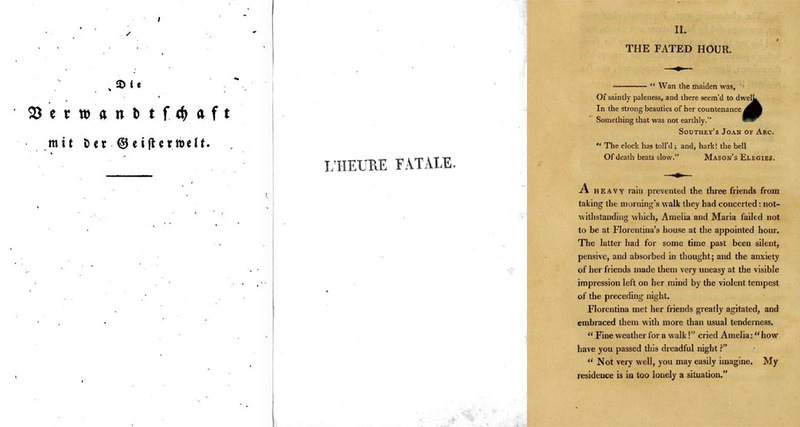 The supernatural elements of a phantom prophesying death clearly find their origin in Schulze’s ‘L’Heure fatale,’ and are adapted by Byron in Manfred to suit his own aesthetic purposes. Moreover, the origins of the curse is never explained in both story and dramatic poem. 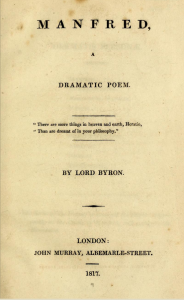 Certainly, the creative influence of reading the Fantasmagoriana stories goes beyond Shelley’s Frankenstein illustrating that these ghost stories capture the creative imagination of the whole Byron-Shelley circle. The next blog will examine the sixth Fantasmagoriana story: ‘Der Geist des Verstorbenen’ / ‘Le Revenant’—the first story in our series that was not translated into English by Utterson for her Tales of the Dead.